In other Rangers news, it only took him a few games, but Tom Renney has re-shuffled the lines again. And they'll look,, well, very much like they did to start the season. Naslund, Drury, and Gomez, the "$18 million line - part 484. . . I'm sorry, part 2. Just seems like that was so, been there, done that. But you never know. I'd have waited til Drury scored at least 2 goals on the season. He did? No. No. I'm still not counting that first one. I'd feel better if it went off his $ss into the net instead of what didn't happen on the Island Monday night. And probably so would he. But I ramble. . . The PS3 Line of Niki Z, Dubinsky, and Voros return again, which I'm happy about. If nothing else, I can pray for goal celebrations, cause theirs have been enthusiastic to say the least. The 4th line remains Betts, Sjostrom, and Orr. Big shocker there. And the 3rd line becomes Callahan, Fritsche and Dawes. Again, Renney, close but not quite. Drop Dawes (again, will he stub his foot pre-game, maybe, possibly?) and put Prucha in there. That's the line I said I wanted weeks ago. And, YES, with Fritsche at center which he will play tonight. Because he is a center. Yes, hard to tell that when the guy doesn't play. But he is. And I hope he and Callahan show chemistry together. Because then I'll be 2/3rds right. And if I-can-do-no-wrong-Nigel does not stub his toe pre-game and misses two or three wide open shots tonight, perhaps Prucha will join Dan and Ryan on Saturday in Toronto. Stranger things have happened. Either way, the Rangers have to watch out tonight. If Johan Hedberg plays, he has done well against the Rangers, for one. But more importantly, I never bet against a team in one of these two situations. Their coach gets canned. Or they get blown out. The following games, they always are pumped up for. The Flyers demolished Atlanta 7-0 on Tuesday night. So I expect them to be angry and take it out on NY. Will it work? 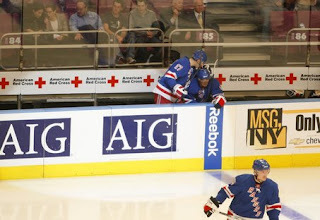 Well the Rangers don't have Sean Avery to get Ilya Kovalchuk off his game any more. So. . . I actually wasn't looking for the Shanny interview in my last post. Or the Stamkos one below. I needed to look up something on Hank Lundvqist and these interviews popped up. But in searching for that one, I found a few more. And I thought this was one of the cuter. Awe. haha. Kid notched his first NHL point the other night. Just seems really down to Earth. And I said it before. Eloquent. Some guys never are able to take the pressure of an interview. This kid, at an age that I was still pretty shy, does a great job. Favorite Meal: "Probably a good seafood linguini." Favorite Breakfast Cereal: "Not a big cereal guy." The league is in good hands. Very good hands. But it was Zherdev who showed the most energy and poise in what was not the world's most exciting game. I mean I was happy because I like Columbus, and have followed them a bit. Glad to see Manny Malhotra back in the lineup as well. Always a big fan of that guy (cried, in fact, when he got traded to Dallas, I must admit). But there wasn't a great pace. It had moments, but not much. And sure, the save by Lundqvist on Rick Nash was nice. But was it really . . . that nice? Credit the Rangers, too, for showing a bit of resilience after their coach, Tom Renney, was hit with a stick or two on the Rangers bench. They came out a little fired up after that. Possible concussion. Hope he feels better. You never like to see those things happen. But you know what, I'm going to let it all go. An important win and two points needed to rebound after the Detroit and Dallas games. They can't all be pretty. Although, again, with the exception of the one against the Devils - were any of these pretty per say? Sorry, moving on. . .
Rangers PP was 1-8. Not a shocker there. And that one goal was not from any of the big money guys on the number one unit. No, it was just from let-me-do-everything-to-win, Brandon Dubinsky. In my eyes it was a good goal and should have counted. I just wasn't sure the guys in Toronto wouldn't focus on the kicking motion that happened AFTER the re-direct. Luckily, they didn't. Fritsche/Voros/Dubinsky were all -1 on the night. Nothing bad, nothing spectacular. Gomez/Callahan/Dawes were pretty invisible too, after better efforts the last 2-3 games. Gomez missed a shot from the doorstep I think he'd like to have back. Dan Girardi had a good night and not just for his offensive output. For the most part, he made and has been making the necessary plays without being flashy. And I'll take that from the young D-men any day. I've heard nothing but great things about Nationwide Arena. And while a Rangers road trip might never make sense in tandom with Pittsburgh, hearing it's only a 2.5 hour drive from there makes it seem slightly less far. Hope to get there though. Til tomorrow's tilt at home versus Pittsburgh. . .good night hockey fans. And I will be at the game, so I won't have the same opportunity to keep track of all other 14 games going on. All 30 teams in action, folks. It's rare, so enjoy. NHL.com should be buzzing. On a side note, in my reading, I found this on a blog and figure that it saves me the effort of typing it out myself. I am trying to see the pattern of who plays when and why, with the carousel-musical chairs-roulette 3rd line I spoke about last week, but I really can't. I can say though that with the way guys like Petr Prucha, Dan Fritsche, and Patrick Rissmiller are shuffled in and out and find themselves playing one game and then not another for three or four at a time, can anyone really blame them for being a step behind when they finally do see game action? I don't think Rissmiller had a good game last night, as people keep saying, but come on. The guy played 6:53 of ice time in one game on 10/11 before having his ankle injured. In his first game back, five later, he is saddled with Chris Drury and Markus Naslund, the inconsistency twins. I'm not saying he's my favorite on the roulette wheel at all, but poor Rissmiller had no shot in hell of impressing last night. Sorry. And I'm sure he's a nice guy, but I actually almost feel as bad for him as I do for Prucha in this (almost. . .). He signs a contract but he really never had a shot here at all. Players better than him who have been here longer never had a shot either. But it was wrong to give this guy a contract here when he could have signed elsewhere and could actually be playing right now. But if you look at the below, it shows that Fritsche got to play a game - a good game in my opinion against Toronto on 10/17, only to be benched the next game. Prucha played his best game, in my opinion, against the Sabres on 10/15 and he was benched the next 3 games. Way to build on their efforts, right? What can they possibly do to build any sort of momentum - from the locker room? And what about the mental games it plays with their head. They have to know they gave their all and that, for the most part, it was better than their teammates. Dawes, on the other hand (and no, no, I'm off my Dawes rant for now), he got to play against Toronto on 10/17, and he had a so-so game. (Because, face it, he looked dreadful in his first three.) But for what reason did he get to play the following night in Detroit? Because he potted a non-decisive goal in the shootout? Okay. Fine. But that gave him a chance to get his legs, get momentum, and feel a part of the team. He's, consequently, looked better and better. Not great, but better. So Fritsche, Prucha, and Rissmiller are not going to be given the same chance? Obviously not. I mean, really, the fairest thing to do is to, as promised, give guys like Prucha a five or so game stretch to play and get their heads and legs into the game. But who do you bench? Well, if I were the coach I'd bench the worst player on the ice for the last nine games. Oh...what, I'm sorry. The Rangers made him captain and paid him $7 million a year. So he has to play every night even though right now he's doing nothing but wasting a roster spot for someone who did look ready to play to start the season. Hmm. Okay. Can't argue there. Dan and Patrick - welcome to New York. Petr - I'm praying for you buddy. I hear California is beautiful all year round. All - I feel sorry for whichever of you becomes the utility guy here. It's going to be a long year. 9 down and 73 to go. I can't say anything more than I just said above. He really never had a chance. And for the record: I predicted on Sept 11th ("With apologies in advance. . .") that out of Aaron Voros, Patrick Rissmiller, and Andreas Jamtin, only one would play on the Rangers this year. So far, with only Aaron Voros in the lineup consistently, I guess I was right. I think that pretty much sums up almost everything you need to know about Sean Avery. The guy, as I've said before and will continue to hold true to, is a character. Plain. Simple. Done deal. He says what he says to get a rise out of those around him. He is an actor, playing a role, and the NHL and it's rinks are his stage. In between it all, he manages to play hockey (sometimes), but he, like me, much prefers his part time job. His - pain in the @ss! But I write this all with a smile on my face. Sean, a character, is also a heck of a hockey player. When he wants to be. I can't in all of my running it through my head, figure out why he would sign in Dallas and purposely try to play poorly there. Again, I've made it clear. If he doesn't play well and keep as good an attitude as possible, no one will take him off Dallas' hands. And the Sean Avery show will come to an end - on ice at least. However, it's really kinda early to be saying that, in my opinion. True, Sean came to the Rangers and the impact was like a flame to gasoline. He ignited. Perhaps he is still getting used to the southern climate. More cowboy boots and less Naked Cowboys. . .maybe? He will return tonight though to a climate he was very familiar with for the bulk of the last two years - New York City. Will the fans great him with open arms and chants of Avery-Avery? Probably not. I do, if I had to take a guess, think he'll get a good reception. I do. He was a big part of this team's success. And I think people will remember that. And given the absolute lack of personality and character on this team right now, I think some miss Sean Avery more than ever. Dallas comes into the Garden at 1-3-1, which I think is below their standards and certainly what I expected from them. The Rangers are currently at 6-1-1 and, might I be so bold to admit, are getting better results than they might be deserving. -The Rangers PP has been horrible. 5 for 39, good for 22nd in the league. Just over 12%. Honestly. . . I never should have said it couldn't get worse. -To expound upon my comment above on the lack of personality on the team. I love the Rangers I really do. I think that's clear. But while I'll try to apologize while being blunt in some of my comments, I'm not going to sugar coat either. If the Rangers did not have Aaron Voros and Brandon Dubinsky, this team would be in a much worse place. In the standings. In moral. End of story. They are contributing in bulk and they are looking alive in doing so. If I were to list the Rangers that had personality (on the ice), I'm looking at a rare few: Valiquette, Dubinsky, and perhaps and at times: Aaron Voros, Paul Mara, and Colton Orr (smiling after fighting never hurts). But seriously, this team is not bursting at the seams with life. It's not. They are winning, which is great, but with the exception of a good goal celebration run from the PS3 line, this team does not really make you feel that they well. . .feel it. It's obviously too early to really comment on this, but I'm just taking a moment to say what I feel. They are winning - yes. But are they really doing it in the way you thought they'd be? Cause I can certainly say, not at all. And I'm also not sure how long it will last at this rate. A strong PK, one line of scoring, and good goaltending can only last so far before more holes are exposed. Just my opinion. Biggest surprise to start the season - negative: a tie for me between Philadelphia and Anaheim's lackluster starts. I'll check in tomorrow with The Return of Avery. . .the Recap. Enjoy everyone. Well the all-time Rangers record for wins to start a season was met, and not exceeded, as the Rangers fell to the Buffalo Sabres last night 3-1. Their record now stands at 5-1-0. It was bound to happen at some point, and people would have probably assumed sooner rather than later, but the top line stopped scoring. You know the #2 line by depth, but the uncontested top line of Dubinsky, Voros, and Zherdev, the PS3 line. And they are due an off night. Especially for a line that was not supposed to be carrying the load and scoring 90% of the team's goals, which they kinda have been. So they had an off night, and with the exception of a surprise goal from Scott Gomez (previously credited to Michal Rozsival), the team was flat. Really flat. Turnovers by defense, by forwards. Sloppy play. Poor marking. Passing that was not crisp. It was not the prettiest night at the Garden. Not the ugliest, but the ugliest this season for the Rangers by far. The first period wasn't so bad, really. But the second and third were clearly owned by Buffalo. And credit the Sabres. I did not think they'd be a good team this year. I thought - probably unfairly - that they wouldn't be able to score (or stop other teams from scoring) consistently. Well, I think I was a little quick to say that. Thomas Vanek has been that guy for a few years now. And when healthy guys like Ales Kotalik and Jochen Hecht usually chip in as well. Jason Pominville has been known to have decent production as well. Maybe I was too quick to judge. But it's hard to see how much of last night was Buffalo playing well (which they did) and the Rangers playing poorly (which they did). So, when your only line that is scoring - umm, doesn't - what happens? Well somewhere in the third period the lines started their typical Tom Renney switcheroo. Naslund, still looking uninspired on the first line, was moved down to play with Korpikoski and Callahan on the 3rd. Prucha, who I'll talk more about in a minute, was moved to the "$18 million" line (which with him it would be $15.6 in case you were wondering). Even the second (and previously most solid) line was torn apart a bit. The uncontested low point of the night was the Rangers not only failing to capitalize on a 4 minute double minor on Sabres captain Craig Rivet for high sticking, but actually giving up the shortie to Vanek, one of his two on the night. The most interesting, it seems, was Rangers Paul Mara mauling Patrick Kaleta. It took me a minute to realize a) Kaleta did not drop the gloves so this was technically viewed as an attack and b) that Mara was out for blood because of Kaleta breaking his face last year. Apparently Kaleta hit him again and Mara flipped out. Even more so, apparently Kaleta was being smart with his mouth. I don't know. I'm not going to judge Mara one way or another on the mauling and the 5 minute major and game misconduct he took (that the Sabres scored on - ruining the Rangers perfection on the PK this season) because sometimes you have to stick up for yourself - and later he said he didn't regret it but apologized to his teammates - but the timing might have not been the best. Although perhaps the Rangers were just not going to win. This is NOT an excuse. Not at all. They could have been mentally sharp even if physically tired. But the schedule has to be getting to them a little. And again, not an excuse, but maybe they were due for a loss. They got up for their home opener, to play the Flyers and then the Devils, and then you have the Sabres coming in in the middle of a seven game in 11 night stretch, and maybe it was just going to happen. Overall, I said it before, so this isn't news, but it's not looking good that our "$18 million" line cannot score whether those players stay on the same line or not. And I'm pardoning Naslund for now. But Scott Gomez, goal not withstanding, has not looked sharp. His attitude seems different too. I mean I haven't caught as many interviews yet, but he doesn't seem as funny or like he's having as much fun. And yeah, when you aren't scoring, you have to be disappointed and maybe that's what I'm seeing, but I'm not seeing a happy or confident person. And I'd like the guy that makes the most money on my team (still shaking head over that one) to be both. Happy and confident. And Drury, oh captain my captain. Yeah. It's been over a year and I'm still not feeling anything warm towards him. I don't dislike him. I don't like him. I just don't anything him. Totally apathy. Except of course for the moments where I'm annoyed because he's making $7 million and has shown barely a spark of a reason why he should be. Really. Faceoffs. If faceoffs were so damn important, Blair Betts could be captain, because that's what he does. And yes, Drury penalty kills. And takes sticks to the face and continues to play. But when does he score? When does he fire his team up? The most - the most - I've seen him fired up was that comeback victory against MM in the pre-season. Other than that, he seems more quiet - and much LESS effective in both word and actions - than the Rangers other silent leaders - Jaromir Jagr and Brian Leetch. He doens't need to be vocal. He doesn't need to be the best player on the team. But, he should look like he has a pulse. And honestly with very, very, few exceptions, this guy has not looked like he's had a pulse in his time with NY. And that's a shame. For us. For him. For everyone. If Aaron Voros, a life long Rangers fan, can get up and get excited for playing for his favorite team, then why can't Drury. He seems like he has pride in being a Ranger, but I want to see that pride. Seriously I am not throwing him under a bus. I've never really said anything bad about the guy and I can't. He's a good guy. But I want leadership. I want passion. And I'd like some of that to be by example. Because, until I see he's worth somewhere close to the $7 million they pay him (even though that may never be the case), I am going to question why he's here and I'm going to be mad when he's not producing. Good guy or not. And as for Captain, I'm sorry, Chris, but you've got big,big shoes to fill buddy. And not just Messier's. Leetch and Jagr are going to the Hall of Fame. Do they have Hall of Fames for role players who happen to find themselves on championship teams in multiple sports and randomly make some clutch plays when they count? You have to check. Okay, good, get back to me on that. Lastly, Petr Prucha returned to the lineup after not playing in the last three games. I made it a point to watch his shifts very closely and mark whether they were good, bad, or indifferent. My results, he had more good shifts than indifferent, and only one or two "bad" ones in my opinion. His first shift, he was flying. Took the puck away. Kept it in the Sabres zone. His second shift, he went down to block a puck that flew off him with such force it sailed right back into the neutral zone. Hobbled off the ice. When I think of that kid, I think of that. "More guts than a slaughter house," coach Renney had said a few years back when describing the young winger. And it's true. His only bad moment that I can remember was when the game was already probably away from the Rangers and Prucha had the puck to the side of the Sabres net on a PP. Instead of shooting, he passsed and it went out of the zone. And that happens. But for a guy that has not played on an every day basis and for someone obviously has less confidence, I thought he played as well as he could. I was hoping he'd score a goal (or two . . .) but it seemed no one could score last night that was not named Thomas Vanek. I hope (hope!) for his sake, it was enough to get him another look. Hopefully the rest of the team will come on board for the next one and we can see how he works into a full group effort. And thus we'll see how it goes against Toronto Friday night. . . In other news around the league, I listened to my first bit of the Stars this season, as they played Nashville. Glad they found the back of the net - six times. And I'm glad Mike Modano has appaently looked solid. A big fan of his for a long time now, I hope he has the type of season he is capable of. And Fabian Brunnstrom becomes only the third player in NHL history to make his debut and score a hat trick. Think the Stars were wondering why he didn't play in their first two games? (and on a line with Sean Avery no less). Oh well. Joel "the other" Lundqvist, apparently made good use of his time, getting 8 hits in just over 10 minutes played. I am so disappointed I missed the Canadiens/Bruins game last night. Sounds like it was a typical Habs/Bs game with a flash for some fights (oh Georges Laraque) and some comebacks. And apparently the ceremony was as only the Habs can do. But, alas, that's why there is youtube. Lots of games tonight but the Rangers schedule is exhausting me (and I'm not even playing, folks) so I fear it might be an early night. Well it's about time. From my keyboard to Renney's ears. . . Prucha in tonight, on a line with Callahan and Korpikoski, the line combo from the starting games in Prague if I am not mistaken. True, true, I said it was Fritsche, Callahan, and Prucha I wanted together. . . but I'll take two out of three and pray. I hope (hope!) for his sake, he has a good game. I guess til then. . . I've said it before and I'll say it again - this guy expresses EVERYTHING that is good about hockey right now. He's young. He's talented. He's a team guy. He's got an infectious smile. He's got a great personality. He's got heart. And apparently. . . he too, has got soul. He might just be the unstoppable combination. Hockey is in good hands - very, very good hands. The guy definitely is - a Rock Star!